After a disastrous 1977 season for both team and drivers, Alex Dias Ribeiro had looked as much on the way out as his employer March or his team mate Ian Scheckter. Indeed, for 1978 the Brazilian was left with no F1 options, moving him to set up an F2 team of his own called Jesus Saves Racing. A very religious man, Ribeiro held an evangelical belief untypical of catholic Brazil but just as his late great countryman Ayrton Senna, he did share a mythical view on divine intervention and providence, especially for the sportsman. In F2, taking a brilliant win at the 'Ring, Ribeiro was back in the category that had provided him with a reputation of a flyer. Hot from his F3 successes with the works GRD and March teams, in 1976 Alex ventured into F2 with March. Arnoux and the Elf Martini team being the class of the field, Alex was usually the best of the rest. A one-off for Hesketh at the Glen, Ribeiro taking the torrid 308D to a steady 12th, led to a full F1 season with the team he'd been with for the past two seasons. But plugging along in an updated 761, the 771 being terribly late and only then given to Ian Scheckter, was too much to take for the 1973 Brazilian Formula Ford champ, a string of six non-qualifications taking a big chunk out of his season. It all looked his debut year would be his last so rather unexpectedly Ribeiro was back at the wheel of an F1 car when Emerson and Wilson Fittipaldi invited him to drive an F6 at the non-championship Dino Ferrari memorial at Imola in 1979. For the two end-of-season North American races he got his last break, Emmo fielding a second car for his compatriot. While his team leader easily qualified on both occasions, Ribeiro failed to do so twice, eliminating his last chance to sign with a Fittipaldi team about to restructure. 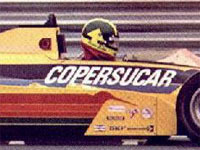 Ribeiro's last two outings also signalled the end to four years of Copersucar sponsorship, the sugar company having been instrumental in the funding of Brazil's national team. Instead of Ribeiro, Keijo Rosberg was taken on, injecting new Skol money into the outfit. Things looked promising with Keke immediately scoring a podium finish at the start of the season in Argentina, but the performance of the F7 tailed off quickly, the design getting replaced mid-season by the F8. At once, Rosberg took the new car into the top ten in qualifying but the decision to stick with an update for the 1981 season and even into 1982 effectively meant the drawing up of the team's death certificate, the squad fading away to the back of the grid, unable to keep up with the spiraling costs of the dawning turbo era. In hindsight, the certificate was ultimately signed two years late.